Make no little plans; they have no magic to stir men's blood...Make big plans, aim high in hope and work. -- Daniel H. Burnham, Pioneering Chicago architect and city planner (1846-1912). Were you as underwhelmed by President Obama's State of the Union Address -- and the GOP response by Rep. Paul Ryan, R-WI -- as I was? Using Daniel Burnham's admonition as a guide, all I could see were "little plans" that won't actually solve the systemic problems of the American economy. Rep. Michele Bachmann (R-MN) was surprisingly impressive with her Tea Party response -- complete with charts and graphs -- but her suggestions fell flat, too. I'm guessing Bachmann will make a run for the GOP presidential nomination in 2012. 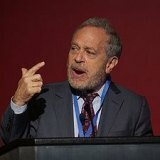 Coincidentally, on Tuesday -- just hours before the address -- I finished reading Robert B. Reich's 2010 book "After Shock: The Next Economy and America's Future" (Knopf), which analyzes what's wrong with our dysfunctional economy and offered what I consider are sound suggestions on how to fix it. Reich is currently a professor of public policy at the University of California Berkeley, but he has had practical experience on the national level: He was secretary of labor in the Clinton administration and has served as an economic advisor to President Barack Obama. He's also served in the Ford and Carter administrations, so he knows all about how things work inside the Beltway. I'm not going to review "After Shock" -- which I recommend without reservation. He even manages to get his stature -- he's 4-10 -- into it, humorously comparing it to the towering figure of former Fed Chairman Paul Volcker, who's almost two feet taller. "After Shock" is short, too, less than 200 pages long, fully annotated and indexed and is well written and easy to understand by non-technical people. Reich is quite a bit to the left of my generally libertarian views, but I'm a cafeteria libertarian, picking and choosing what I want from the menu, so that's no impediment. I think he's on target when he writes that the real problem with our economy is structural: It lies in the increasing concentration of income and wealth at the top, with a middle class that has had to go deeply into debt to maintain a decent standard of living. The concentration of wealth is equal to that of 1928, he writes, and we all know what happened the following year (or we should if we're smarter than a Fifth Grader!). * A reverse income tax that supplements the stagnant income of middle class taxpayers. Similar to the earned income tax credit that helps lower income people survive. * Medicare for all, opening the highly regarded program to anyone willing to buy into it. I've blogged repeatedly in the past in favor of just such a move, especially since tens of millions of Americans are still without health care coverage, even after the passage of last year's "Obamacare." (A link to a blog by me on the subject: http://archives.huntingtonnews.net/columns/091022-kinchen-columnsparallel.html). * Higher marginal tax rates on the wealthy, who manage to use loopholes to bring down their tax bills. People in the top bracket, with paychecks more than $400,000 a year (one percent of the taxpayer universe), would pay 55 percent; those earning more than $260,000, 2 percent of the taxpayers, would pay 50 percent; those with paychecks of more than $160,000 a year (top five percent of taxpaying universe) would pay 40 percent. * A carbon tax, taxing fossil fuels (coal, oil and gas) based on how many tons of carbon dioxide such fuels contain. This would be very unpopular in Texas, where I currently live, and West Virginia, where I used to live. * School vouchers based on family income, introducing competition into the school system. I'm guessing that pro-labor-union Reich would encounter opposition from teacher unions on this proposal. * College loans linked to subsequent earnings, with those in lower paying professions like teaching or social work paying less of their loan amount than those in investment banking or corporate law. Gee, that sounds a lot like a book review to me! So be it...Read "After Shock" and see if you agree with Reich's prescription for our chronically ailing body politic.